As a way of looking back over this monster year, on Twitter over the past week we’ve been counting down the best of 2015’s blog – the Top Ten most viewed Grant Museum posts of last year*. Looking back, it’s certain that we’ve had a top year in terms of blogging, with 93 posts from Team Grant. But what were the best posts? For the past fourteen weeks a kangaroo has been the most celebrated object in the Grant Museum, but it was not part of our collection, nor was it a zoological specimen. Europe’s first painting of a kangaroo, from 1772 by George Stubbs left us just last week. It had been the centrepiece of our Stange Creatures exhibition and now it is continuing its nationwide tour from the National Maritime Museum*. I have argued it is one of the most important artworks in the history of British exploration. In reality, not even Cook thought this was true. Australia had been known by the French, Portuguese, Spanish and Dutch (hence its original European name “New Holland”, which Cook himself used) for at least two hundred years before Cook landed in the southeast of the country on his ship HMS Endeavour. Obviously Indigenous Australians and their neighbours also had been there for around 50,000 years. This painting helped begin Europe’s relationship with Australian wildlife. 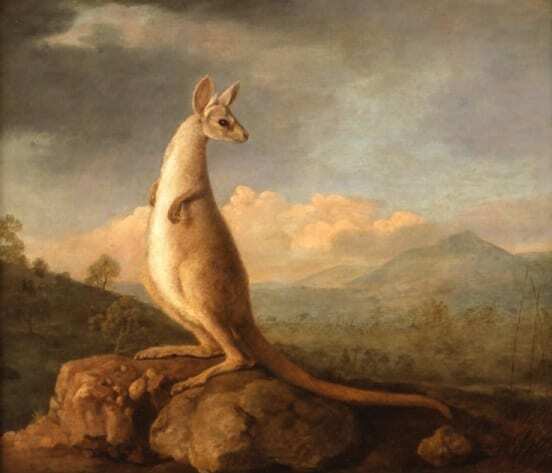 Commissioned by legendary naturalist Joseph Banks, painted by celebrated animal artist George Stubbs, and based on findings from Captain Cook’s famous voyage, this kangaroo truly captured the country’s imagination. Stubbs’ image became the archetype for representations of kangaroos for decades – reproduced and refigured prolifically. It may not be anatomically perfect, but this is how Britain came to know the kangaroo. It is an emblem of the age of exploration at the historical threshold of the European occupation of Australia. Nothing was ever the same again. This week I’m honouring a mammal that we can link to two significant factors in my life recently. 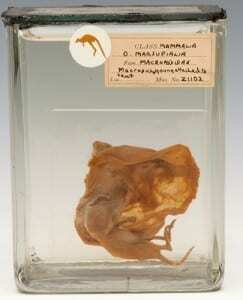 First, it’s an Australian hopping marsupial, as are kangaroos. Our current Strange Creatures exhibition centres around Europe’s first painting of a roo – by George Stubbs. Secondly, I’ve been in Australia for the last few weeks doing fieldwork with the Australian Wildlife Conservancy, and my first task was to help test a mechanism for surveying this Critically Endangered mammal. What kind of animal is a Yoshi? Our current exhibition Strange Creatures: The Art of Unknown Animals features images, specimens and objects all related to how animals are represented through time. The exhibition is centered around George Stubbs’ painting of a kangaroo, an iconic image despite the fact that he never saw a kangaroo first hand. From dodgy taxidermy, dinosaur toys, glass models and wildly inaccurate images of animals which were claimed to have been studied from life, the exhibition explores how we make sense of a newly discovered animal species from first encounters with living animals through to reconstructions made from written accounts and sketches. Initial encounters with kangaroos drew comparisons with more familiar mammals such as jerboas, greyhounds, mice and deer, the creature so strange to European explorers it didn’t fit within existing classifications. What happens if we start from an animal that we only know from a reconstruction? In the past (and today) mermaids, unicorns, giants, cyclopses, goatsuckers and deathworms have all been speculatively described either due to pervasive myths, hoaxes, delusions or confusion with other animals. To help with the process of working out how we identify animals we know from reconstructions alone, let’s see if we can work out how we’d classify a well known fictional animal, Nintendo character Mario’s companion and steed Yoshi*, this one acquired in a Happy Meal and currently on display in our exhibition. This week’s specimen of the week is another specimen highlighted in our current exhibition Strange Creatures: The Art of Unknown Animals and yet another dinosaur specimen from me. In our exhibition about representing animals through art and science, this specimen is in a case about how understanding of extinct animal biology has changed through the discovery of new fossils and advances in analytical techniques and tools. Today’s specimen is often described as chicken-sized which is one of the go-to standard measurements of animals in popular culture, the full scale goes; mouse-sized, chicken-sized, turkey-sized, terrier-sized, volkswagen-sized then various dimensions expressed in double-decker buses ending with Olympic swimming pools and football pitches. There is a separate system for brain sizes oriented around fruit, nut and sporting ball sizes. This week’s specimen of the week is an object that is very special to me and one of the objects featured in our current exhibition Strange Creatures: The Art of Unknown Animals. The theme of the exhibition is representations of animals centred around George Stubbs’ painting of a kangaroo, Europe’s first painting of an Australian animal which became the archetype for how people imagined how kangaroos looked, despite the animal itself never being seen by George Stubbs. In addition to this painting the exhibition focuses on representations of animals across modern scientific modelling, medieval manuscripts and, a part of the exhibition that is very close to my heart, representations of dinosaurs in popular culture in the form of toys, comics, video games and film. This week’s object from the exhibition is from my own personal collection, my first ever dinosaur toy which may be surprising to find in a museum but mass produced ephemera can tell us a lot about societies’ interpretation and response to ideas of extinct creatures despite being very far removed from any actual scientific investigation or research. Imagine that you are in a place no-one from your country has ever been before. 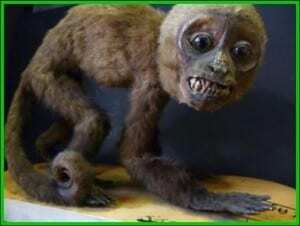 You have just set eyes on an animal incomparible to anything you’ve ever encountered – it might as well be an alien. Cameras haven’t been invented. It will take a year for you or anything you send to reach home. Your job is to communicate what you’ve discovered to the people back home. The artistic outcomes of scenarios like this are the basis for much of our exhibition Strange Creatures: The Art of Unknown Animals, which opens today. By examining the world of animal representations, the exhibition explores how imagery has been used to bring newly discovered animals into the public eye. From the earliest days of exploration, visual depictions in artworks, books, the media and even toys have been essential in representing exotic species that are alien to people at home. Strange Creatures investigates what we can learn about art history by researching natural history, and what art history can contribute to natural history.